Every year a unique festival is held in the Northeast China, a city known as Harbin. It's hosts one of the most amazing ice and snow sculptures, Every year it starts on January 5th and ends on February 25th. It features some of the most beautiful and stunning ice sculptures in the world. This is one of the largest ice and snow festivals around the world. Some of the ice sculptures will be illuminated in light, to make the look stunning. In Harbin, you can witness the best ice sculptors around the world. The festival was originally started in 1985 and it's an annual celebration, which starts from end of December till February, mostly during the coldest of the months. The first ice lanterns was setup during the Qing dynasty, farmers used to fill their buckets with water and left them to freeze. Then they were warmed slightly before removing the bucket shaped ice. A hole was made in the ice and then a lit candle was placed inside to make them look like lanterns, over a period of time, they have changed and many new architectures are created and it's lit up to make them glow. 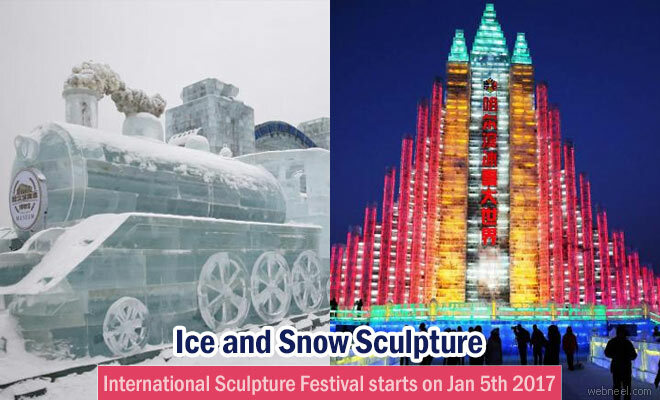 The Ice and snow sculptures are mostly displayed in three places: The Sun island park, Ice and snow world and the Zhaolin Park. The Sun Island park has one of the best indoor snow sculpture museum.Ice and Snow world has some of the best architectures like 'The Great wall of China', chinese fairytale sculptures and so on. Zhaloin park has the most glowing ice lantern sculptures, which is really wonderful and magnificent. 1. Entrance: The main entrance of the festival’s venue is by the Flood Control Monument. 2. Tickets: To enter different venues (parks) of the festival, you have to buy different tickets in different prices. 3. If you enter the Zhaolin Park before 15:30 pm can get a discount at ticket price, but it is not the best time to see the ice lanterns. After 5:50 pm, the best time there is no discount. 4. The Harbin Ice Festival 2017 will be closed at the end of February. 5. The theme parks of Harbin Ice Festival 2017 will have a trial operation from around December 24, 2016 to January 4, 2017. The festival will be officially opened to the public in January 5, 2017.